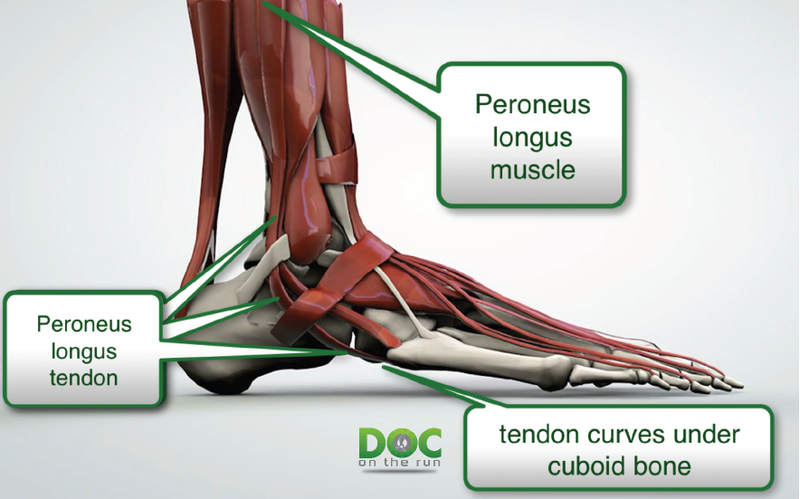 Today on the Doc On The Run Podcast we’re talking about peroneus longus tendinitis, and what runners can do about it. Before we get started I want to mention that I added a video that will show you how runners decrease stress and strain on the peroneus longus tendon, just by running on the right side of the road. Whenever I do consultations for runners who have peroneal tendinitis, they seem to be confused. 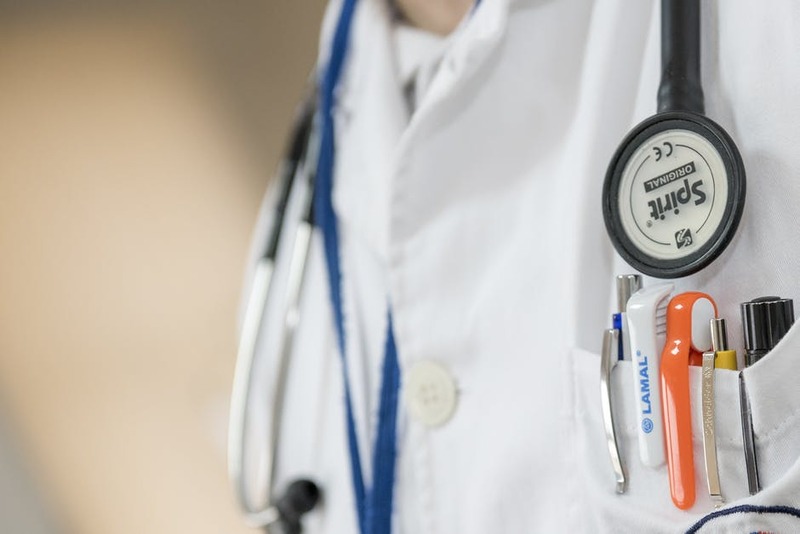 Even though many of them have already been seen by an emergency room physician or their primary care doctor, they seem to be really unclear about what exactly is going on in their foot and ankle. If you aren’t clear on what is wrong, it’s hard to be clear on what you need to do to heal, and run without further injuring the tendon. Part of the confusion lies in the fact that there are two different tendons (the peroneus brevis and the peroneus longus) which both run down the side of the leg and then attach to your foot. But they attach to your foot in different locations and they both do different things. Because they have different functions, they can become injured in different ways. If you want to get back to running as quickly as possible it’s extremely important to figure out exactly which one of the two tendons is bothering you. Understanding which one is injured will give you a better chance of getting the tendon to heal faster, and get back to running sooner, without re-injury. We talked about a lot of this in earlier episodes but it’s probably worth mentioning again that there really are a couple of different injuries that can happen to this one particular thing called the peroneus longus tendon. Let’s gets quickly review the anatomy. A tendon is basically a big cable of collagen that attaches a muscle to a bone. When the muscle fires, it contracts and pulls on the tendon. Tendons only pull, they don’t push. The tendon pulls on the bone and moves the foot in one direction. All of these are different conditions. And even though they all apply to one particular tendon, they are all different tissues. And they all heal a different rates. They heal with slightly different treatments. To confuse things even further you have to understand the peroneus longus is much longer than the neighboring peroneus brevis muscle. The peroneus longus tendon also changes direction several times. Because it changes directions several times it may cause pain in a number of different locations on the outside of the leg, the ankle or the foot. That is actually a good thing to you trying to figure out what’s going on, if you are trying to do some sort of self-diagnosis routine. The location a maximum tenderness is almost always the location of maximum trouble. So most runners can actually push around on their leg, foot, ankle and figure out which specific structure has become injured. Once you figure which portion of the peroneus longus is irritated, you can then decide what you need to do to get it to calm down as quickly as possible and get back to running. Let’s talk about the anatomy of the peroneus longus so you can understand it a little better. In the simplest sense, the peroneus longus is one of the stabilizers of your foot and ankle. But really, if you break it down, the primary job in life of the peroneus longus is to twist and lock the first Met-Cuneiform Joint in your mid foot. That helps convert your foot into a rigid lever. You can use that lever to push off when you run. The tibia bone is the shinbone. The fibula bone is the other bone that goes from your knee to your foot. The fibula bone is on the outside of your leg. If you look down at your ankle the lump a bone on the outside of your ankle is the end of the fibula bone. If you put your thumb on that lump of bone and then you work down slightly, even just an inch or two, you feel the fibula bone disappear under a soft muscle. That muscle is the peroneus longus. If you look at some old medical textbooks they actually use a different term. The peroneus longus used to be referred to, perhaps more appropriately, as the fibularis longus. That really does make more sense since the muscle and tendon are behind and attached to the fibula bone. Although it is theoretically possible to strain the peroneus longus muscle, in practice, it’s pretty unusual. The muscle just isn’t strong enough and doesn’t pull hard enough to easily tear the muscle belly. That sort of thing is a lot more common with the calf muscle and Achilles tendon, which is much stronger and pulls with a lot more force. But if you did have a strain of the peroneus longus muscle it would be tender if you push anywhere along the muscle belly from just below the head of the fibula up at the knee to about halfway down your leg. If you test the peroneus longus, and push into the muscle with your fingers, and that causes even more tenderness, that tenderness more or less confirms the diagnosis of a peroneus longus muscle strain. But more often than not, when the peroneus longus muscle gets overworked during a long work out, the muscle just simply fatigues and stops pulling as hard. When it stops pulling hard, the muscle isn’t dynamically absorbing force. See you get more abrupt, more static loading of the tendon itself. That shock loading of the tendon can lead to tendinitis. Tendinitis is just inflammation of the tendon that attaches the peroneus longus muscle to the foot. As we mentioned earlier the peroneus longus tendon can become inflamed in three different locations. The most common location for peroneal tendinitis in runners seems to be behind the fibula bone. Because the two tendons, both the peroneus longus and the peroneus brevis have to curve sharply around the back of the fibula bone it just makes sense that they could become irritated and inflamed as they curve and glide around the back of the fibula bone. So if you’ve been told that you have peroneal tendinitis, and it hurts when you push on the tendons at the back of the fibula then you could have tendinitis of one or both of the peroneal tendons. In most people it’s rather difficult to just push and feel whether its the peroneus longus or the peroneus brevis. However, if you test the tendons individually, by moving your foot in the motion that you know will fire that one tendon, that one tendon will become tight making it easier to feel so you can push on that individual tendon. Obviously, if it hurts when you push on the peroneus longus, but not when you push on the peroneus brevis, then you know you have a problem with the peroneus longus. On the other hand, if it hurts when you push on the peroneus brevis, but not when you push on the peroneus longus, then you know you have a problem with the peroneus brevis. That distinction is important because if you have a problem with the brevis, you could have a tear or a split in the tendon that might require surgery. 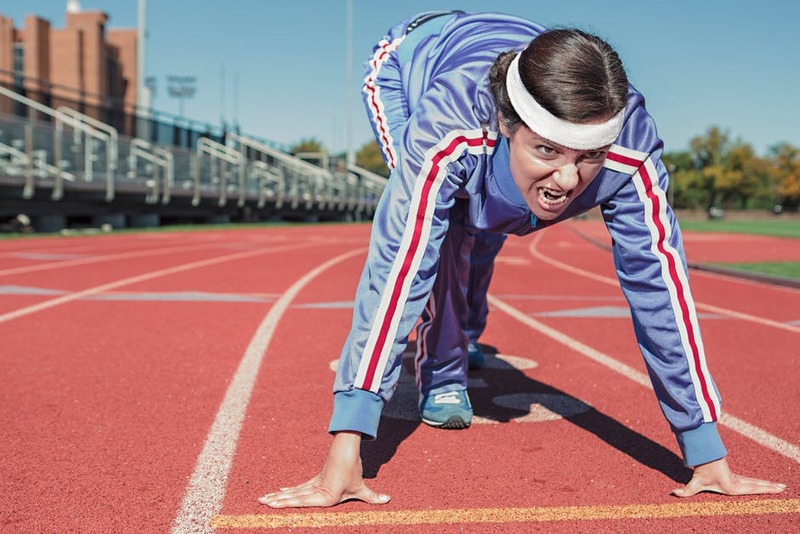 But if you can test the tendons individually and can confirm that it really is the peroneus longus, you have a better hope of treating it on your own successfully, and getting back to running. If you push on the two tendons behind the end of the fibula at the outside of the ankle, and you have tried to isolate them, but you seem to have pain when you push on both the peroneus longus and the peroneus brevis, you may just have inflammation of the sheath that surrounds the two tendons. Of all the problems that can affect the peroneal tendons, peroneal tenosynovitis is by far the most common one in see in runners, and also the simplest to treat. It also heals the fastest. So if you think tenosynovitis is your problem (because it seems to hurt when you test both of them) just go back to the session on peroneal tenosynovitis, try those at-home treatments, and see if you start to improve quickly. If you respond really quickly, you are probably on the right track. Once the peroneus longus exits the tendon sheath on the side of the foot, the tendon turns underneath the cuboid bone. The peroneus longus actually sits in a groove on the outside edge and bottom of the cuboid bone. This is another one of those locations where the peroneus longus changes directions, creates lots of friction, and can become inflamed. So if you are able to push directly on the tendon, in this location, and it causes pain you likely have peroneus longus tendinitis. If you then test the peroneus longus and simultaneously push on the tendon where it curves around the cuboid bone, that will hurt even more, which can help you confirm a diagnosis of peroneus longus tendinitis. After the peroneus longus curves around the cuboid bone it goes straight across the bottom of the foot to attach to the base of the first metatarsal bone. The first metatarsal bone is the one that goes from the mid-foot all the way out to your big toe joint. So when you are standing up on your toes, most of your weight is actually supported by the first metatarsal bone. When the peroneus longus muscle fires, the tendon pulls at an angle to twist and lock that metatarsal bone into position. Locking that joint makes the bone stable. That stability is what allows you to stand up on your foot without bending your foot in half. It is possible to get inflammation and irritation of the peroneus longus tendon where it runs across the bottom of the foot. Although it is fairly unusual, it does happen. In fact, last week I saw three people with this particular problem. In most cases it seems to occur from a twisting injury. If you slip and fall with your foot locked in an odd position this could happen, if it pulls and stretches the peroneus longus tendon. Interestingly, because it does cause pain on the bottom of the foot many people incorrectly assume they have plantar fasciitis. But when I take a look at them and push on the plantar fascia it doesn’t hurt at all. But, when I test the peroneus longus tendon and then push along the bottom of the foot, pressing my fingers along the anatomic course of the tendon as it goes from the cuboid to the base of the first metatarsal bone, this causes a lot of pain. Pushing on the tendon on the bottom of the foot and reproducing tenderness, confirms the diagnosis of peroneus longus tendinitis. What Causes Peroneus Longus Tendinitis in Runners? Peroneal longus tendinitis can be caused by a twisting/fall type injury but it can also occur as an overuse injury in runners. Many doctors will tell you that running is overuse. But I disagree. When I think of overuse of the peroneus longus tendon in runners, I just think about how too much force gets applied to that particular tendon. All an overuse injury is really, is the circumstance in which you apply more stress to one particular anatomic structure then it can tolerate. It’s not just too much of one activity. If you put the foot in a position that stretches the tendon more than normal, you can get irritation of the tendon when running a much shorter distance. If you think about the way the peroneus longus tendon curves around the outside of the ankle and then around the bottom of the foot, you might start to realize that when you supinate your foot (lifting the arch up off the ground), you actually stretch the peroneus longus tendon more than normal. That’s part of the reason runners with really high arches are more prone to developing peroneus longus tendinitis than runners with flat feet and low arches. It’s pretty easy to run on a trail and find a severely sloping surface. If you spend too much time on one particular side of the trail, you could develop peroneus longus tendinitis. If you run in unstable minimalist shoes, and you are not used to them, you can overwork the peroneus longus muscle. All of that time landing on the fore-foot and mid-foot requires the peroneal muscles to stabilize you. If you are not used to running in minimalist shoes, if you are not used to running as a fore-foot or mid-foot striker, if you do it too much, too soon, the muscle can fatigue. Remember, once the muscle gets tired the tendon starts absorbing more force. If you are running on a severely sloping trail for 5 miles it could be the equivalent of running 15 miles of peroneal stress on the road. If it’s one of your first runs in minimalist shoes, and historically you have been a heel striker, running for 3 miles could be the equivalent amount of abuse that you would get from a ten 10 or 15 mile run in your normal shoes. Either way, what we’re talking about is an overuse injury. It’s not the distance. It’s not the shoes. It’s the position of the foot. It’s the cumulative stress that gets applied to one particular muscle and tendon that isn’t prepared to deal with that abuse. It’s just not yet strong enough to take it. If you apply too much stress to the peroneus longus tendon, and then you stress it again before it has fully recovered from the previous workout, you get inflammation within the tendon. The tendons themselves are basically cables made up of collagen bundles. They don’t have great blood-flow. And they are very dense. So when you get inflammatory fluid trapped within the tendon itself it takes longer to get rid of it. Remember… “-itis” means inflammation. Tendinitis is basically just a problem of inflammation. The very first step is to decrease the inflammation. We discussed all the ways runners can reduce inflammation on their own in the episode on peroneal tenosynovitis. If you go to the show notes page for this particular episode we will have a link to take you directly there. Do everything that will decrease the inflammation for peroneal tenosynovitis and it will also help peroneus longus tendinitis. When I see a runner who calls me with a case of peroneal tendinitis, in most cases, the very first thing I do is give them all of the treatments that will help calm down peroneal tenosynovitis. If they get better really quickly, then we know it’s just inflammation of the tendon sheath that surrounds the two tendons. So basically, problem solved. 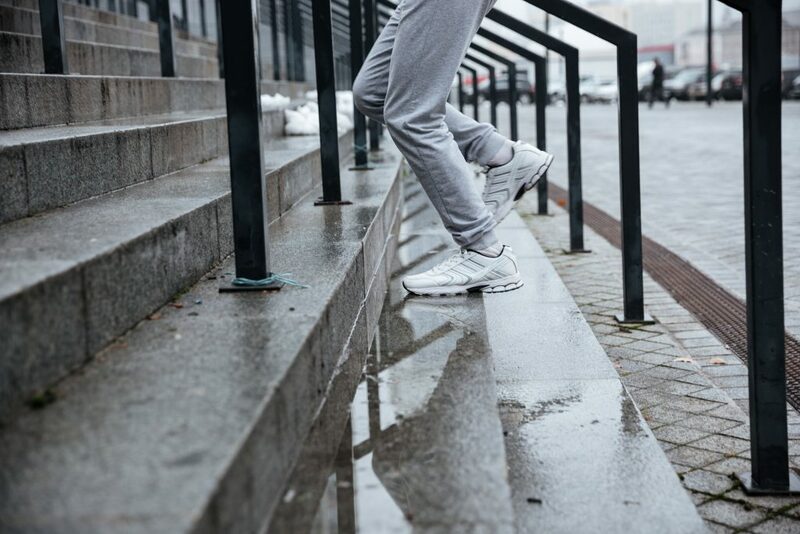 But if they get a little bit better initially and then quickly plateau, and still have pain, it’s more likely to be a problem with one of the two peroneal tendons like tendinitis. The most important thing to understand is that most of the treatments which will help tenosynovitis will also help tendinitis. They are both conditions involving inflammation. And the most important thing to do initially is remove the inflammation. Test the tendons individually and determine which one is causing the problem. If it is the peroneus longus, stabilize the foot and then make sure you don’t do any of the things that will irritate the tendon. What Helps Peroneus Longus Tendinitis Heal? If you understand the main function of the peroneus longus is to stabilize your foot and allow you to stand up on your toes, all you have to do is avoid exercises that replicate that motion. Don’t stand up on your toes. Avoid calf raises at the gym. Don’t stand up and pedal hard on your bicycle. Don’t get on a rowing machine and push all the way at the end of the rowing stroke, where you extend your toes and push down as if you are pushing on the gas pedal. 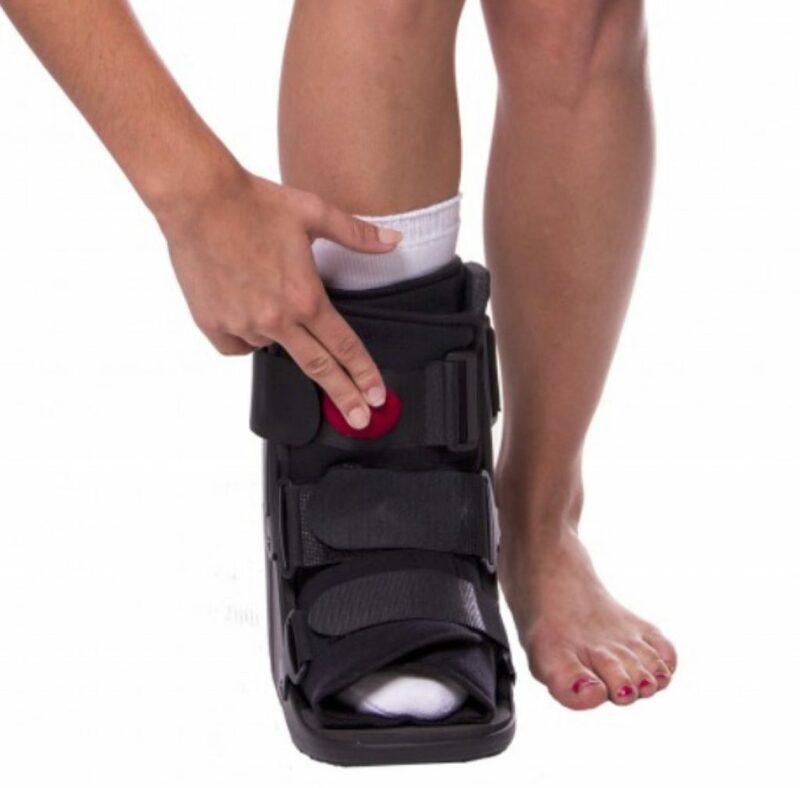 If it’s really irritated, tender and painful, you can always wear a fracture walking boot for a brief period of time to jumpstart the healing process. But in general, I don’t really recommend the common regimen of wearing a fracture walking boot for 4 to 6 weeks when runners have this problem. In most cases runners can wear a boot for a very brief period of time and then get back to activity way faster that 4-6 weeks. Even if you do wear a fracture walking boot for a short period of time you have to take every effort to maintain the rest of your running specific fitness so that you are in a better condition to return to running as soon as the tendon is actually healed. And once you start running again, make sure you give the tendon to break. Don’t run on sloping surfaces. Avoid loose terrain like sand. Run on flat ground so you are not supinating the foot and stretching the tendon. Make sure you deliberately and intentionally increase your distances while you are removing the other variables like the slope of the road that can stress the tendon. If you decrease the stress on the tendon, you can run longer before you are at risk of causing more inflammation again. The bottom line with treating peroneal tendon injuries is to make sure that you know exactly what the problem is. Treat it as quickly as possible. Make sure you maintain as much activity as you can…while you continue to heal. As a runner, you really have to make sure you are getting the most appropriate treatment for you, with your potential to heal, with your particularly injury and in a way that will help you maintain your fitness and keep on track with your running goals. As soon as you get done listening to this, go to DocOnTheRun.com, go to the podcast show notes page for this episode and check out the video that shows you how to reduce stress and strain on the peroneus longs tendon, just by running on the right side of the road.